Not so cheap, but very chic is the 'Borsa Tracolla' Shoulder Bag by Moschino Cheap & Chic Handbags. 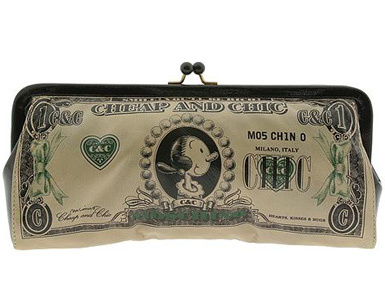 A kiss-lock frame clutch is printed on the front with a cutesy dollar bill, with Olive Oyl as president. It’s a compilation of a cool throwback to old school Popeye cartoons, coupled with a modern cheekiness. Buy it now for $433.95 at, Zappos.